I had attended XRM Virtual User Group meeting regarding “your first interactive look at CRM 2011” by Eric Boocock (Senior Technical Product manager at Microsoft) earlier this week. 	Flat UI (no longer tab based browsing on CRM Form) and you can collapsed different sections to browser easier to go to relevant data. 	Header and footer section on each CRM form. 	Easy way to build & deployment solutions (i.e. customization) from one deployment to another deployment. 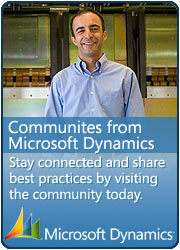 This entry was posted in CRM 2011 and tagged Dynamics, Others on September 10, 2010 by mayankp.